Passengers at a remote Siberian airport had to push their aircraft in order to fly on Nov. 25 after extreme sub-zero temperatures froze the airplane’s undercarriage. 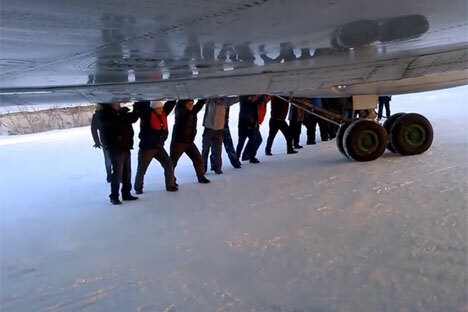 Passengers on a charter flight from the northern city of Igarka to the central Siberian city of Krasnoyarsk, 2000 miles east of Moscow, were obligated to lend a hand to push their 47-ton TU-134 onto the taxiway after the undercarriage of the plane froze in extreme temperatures. The incident occurred on Nov. 25 at the airport in Igarka, 780 miles north of Krasnoyarsk. According to Oxana Gorbunova, senior assistant of the Western Siberian Transportation District, the flight, operated by Katekavia Airlines, was carrying seven crewmembers and 74 passengers, reported to be shift workers. "According to a preliminary investigation, the air temperature fell to minus 52 degrees Celsius [minus 61 degrees Fahrenheit] and the brake system had frozen while the plane was parked," said Gorbunova. "The pusher was not able to move the plane towards the taxiway and the passengers decided to help, which is unacceptable because the aircraft cabin could have been damaged." The Western Siberian Transportation District Attorney is now examining the implementation of the flight security regulations in order to determine the legitimacy of everyone's actions: the airport and airline officials, the crewmembers and the passengers. Katekavia Airlines told RIA Novosti that so far it does not have any information on the matter. Igarka airport is a regional air transportation hub of the Krasnoyarsk Territory. As of today, almost 100,000 passengers travel through the airport annually.